If you’re a geek or have a geek in the house you probably know all about Doctor Who and his faithful TARDIS. If you don’t have a geek in the house, you’ve probably still seen pictures of what looks like a blue telephone booth (it’s actually a time-traveling spaceship that happens to look like a police call box). 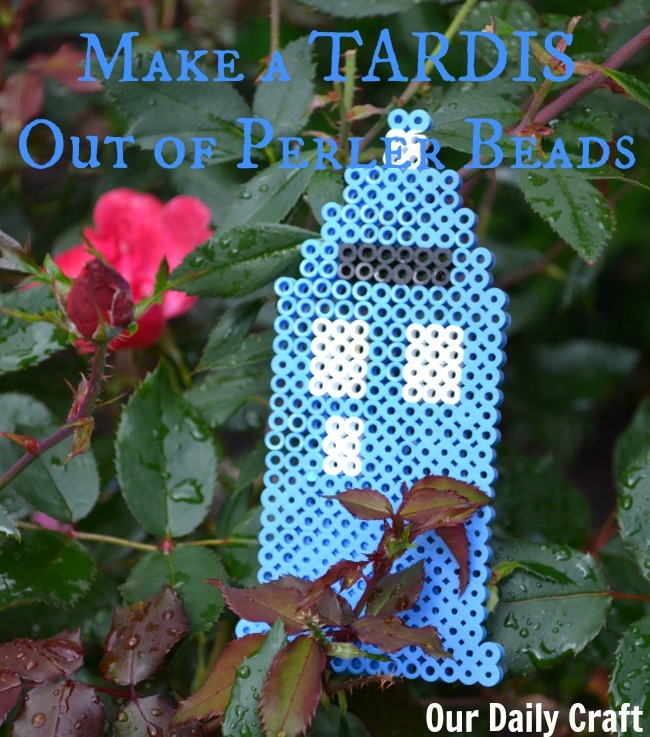 In celebration of the geek in my house and the 50th anniversary of the Doctor Who series this year, I thought I’d craft up a little TARDIS of my own from Perler beads (or melty beads, whatever you want to call them). It’s actually a pretty easy project, a lot of fun, and the perfect thing for geeky Halloween or other holiday decor (you can bet I’m finding a place for this on the Christmas tree, right alongside the “Star Wars” ornaments). I actually started with the outline, then filled in the details and added the rest of the blue. 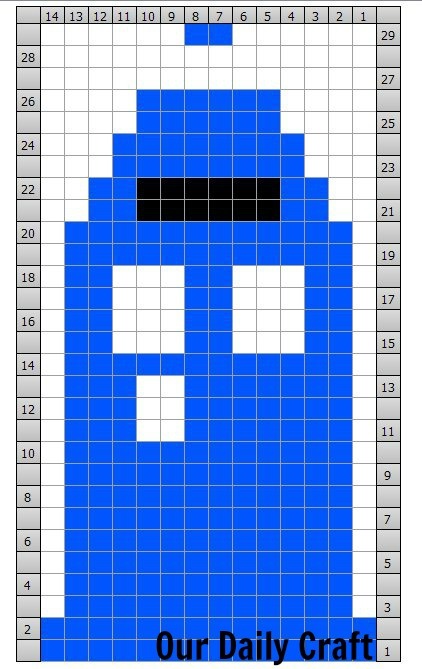 It’s really simple to make this on your own without the chart, but I wanted to include it just in case.Start at the bottom of the peg board with 14 blue beads and do that for 2 rows. Then I did 12 beads across for 8 rows. The next 3 rows have a 2-bead section of white after 3 beads of blue on the left-hand side (that’s for the Police Call Box sign), then there’s one solid row and then 2 blue, 3 white, 2 blue, 3 white, 2 blue across for 4 rows for the windows. Then 2 rows solid again, 2 rows that have 10 beads (2 blue, 6 black, 2 blue). Then 2 rows of blue with 8 beads and 2 with 6. The top is 2 beads each for 3 rows: 2 white and 1 blue at the top. Follow the directions for melting your beads. Mine just use a warm iron, put the paper on top and go until they’re melty. Let cool a bit, remove the paper, flip and repeat. The finished TADRIS, ready for adventures in space and time. I love this bit of geek craft! 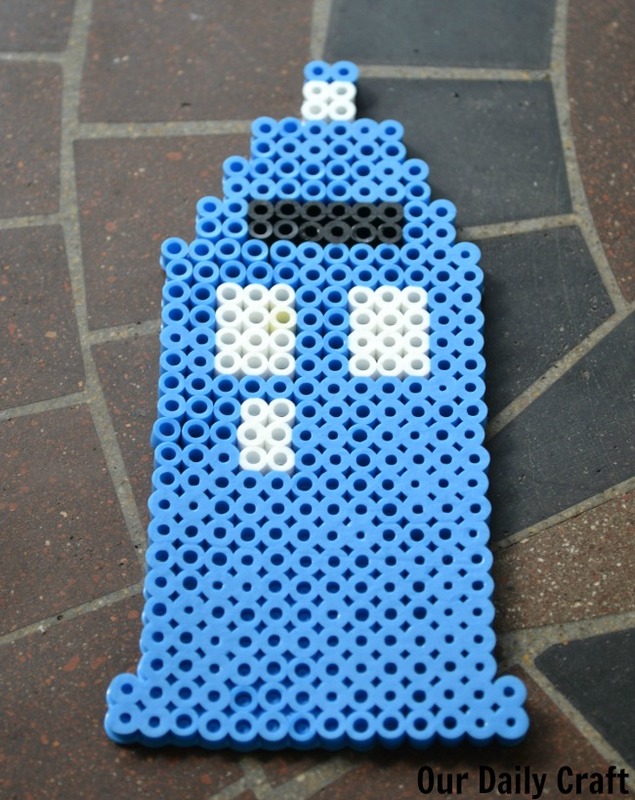 Have you ever made any geek-inspired crafts? I’d love to hear about them. And if you happen to have a geek kid in your house, check out the activities for geek kids my friend Amanda highlights on her site.